HHC has launched their annual Kokua for Charity for the month of October. Each brand has designated a charity or person that will receive donations for their polishes. Kokua is a Hawaiian word that means "to help." Application was easy and smooth in two coats, it does contain glitter so I recommend the foil method or using a peel off base. This is her third year participating in our charity event too! Mildred has been a life long lover of animals. It seems fitting that she would choose PetSmart Charity as her kokua charity. https://www.petsmartcharities.org/ This is the first time HHC has had a pet rescue for kokua month. It's so timely with all the hurricane pets needing help. 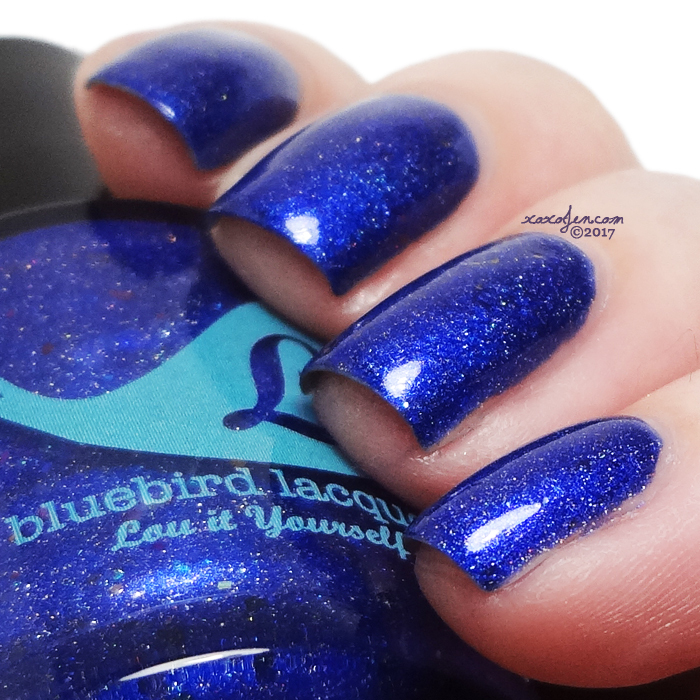 a sapphire holo with a rainbow of ucc and crystal flakies. Formula was buttery and awesome, two coats with topcoat shown. 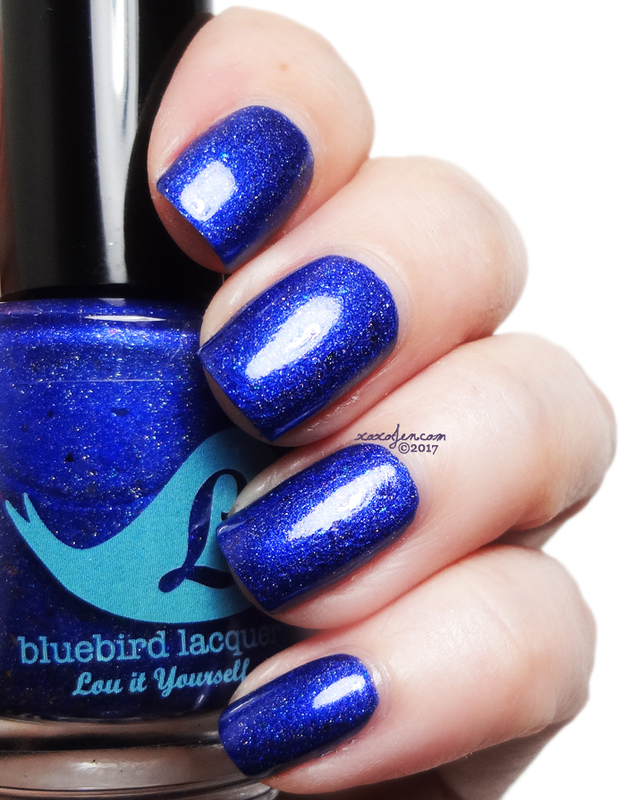 a memorial polish for Lou's best friend's mother who passed away recently, after battling cancer. Cecilia was an amazing mother and not only to her own children but to her grandchildren. Lou says that she thinks that Cecilia was the definition of a wonderful mother in so many ways and she deserves a medal because she was a mother when no one else could be. Because of Cecilia's love and compassion for children, Lou decided donate to St Jude's for childhood cancer treatment in her name. 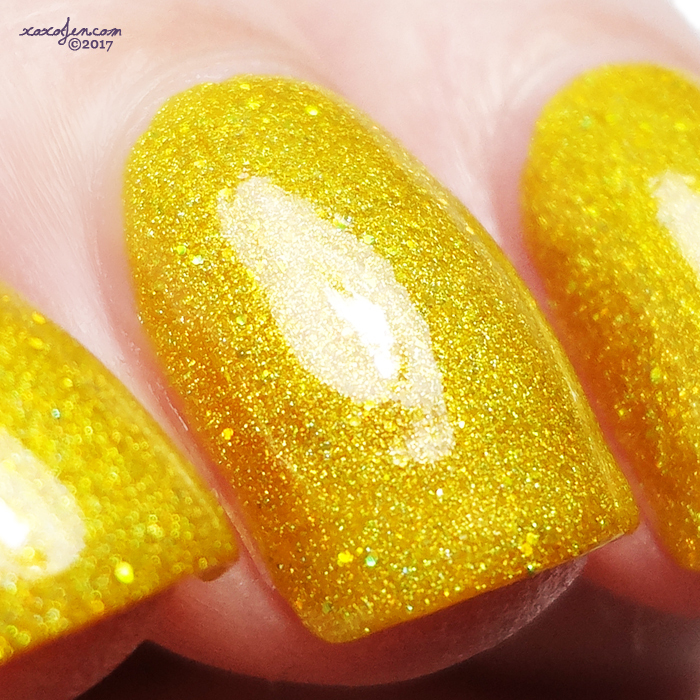 In bright sunlight this beautiful linear holo appears as a yellow-gold base and in shade it takes on a mustard hue. It also has gold flakes, and gold holo glitters. Such a gorgeous shade of yellow! Easy to apply, awesome brush (I can't mention this enough!) and opaque in two coats. Victoria has chosen a cause that is very dear to my heart. http://www.hvafofindiana.org is her charity. This organization helps seek out homeless veterans and helps them find housing/employment as well as providing things like food and healthcare. 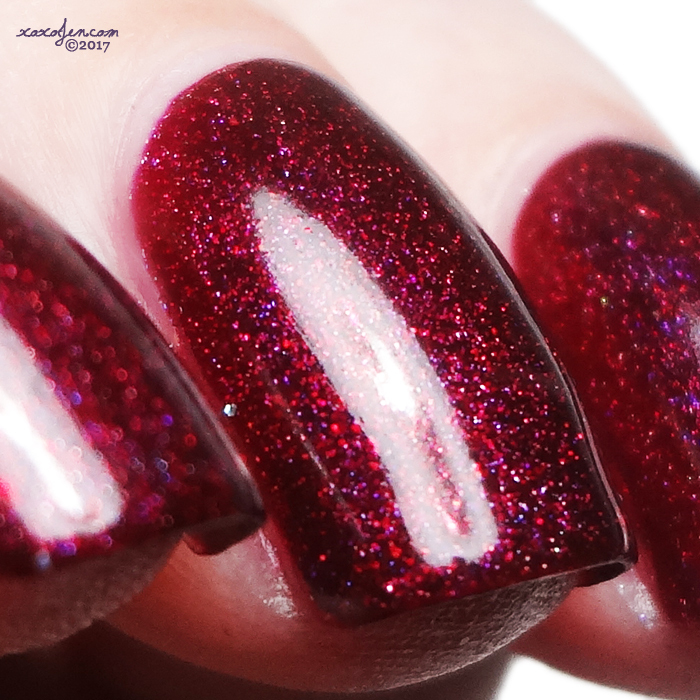 A deep rich red filled with holo sparkle, Unicorn pee and Unicorn pigment for extra shimmer and sparkle. I wore this for a special event and it was perfect. Opaque enough in one coat to wear on its own but for added depth, two coats is amazing. Leah Ann has been bothered by what is going on in Puerto Rico recently an in true Leah Ann style decided to act. wishing to help a friend's family that is in need. Another indie brand, Jior Couture (Sacha Junique) has family that has been personally devastated on the island of Puerto Rico. After discussing the dire situation with Sacha, Leah Ann could not stop thinking about the help that was needed there so she decided to help her friend's family. Leah Ann is finishing up her charity polish and will be donating 100% of her funds to help this family. 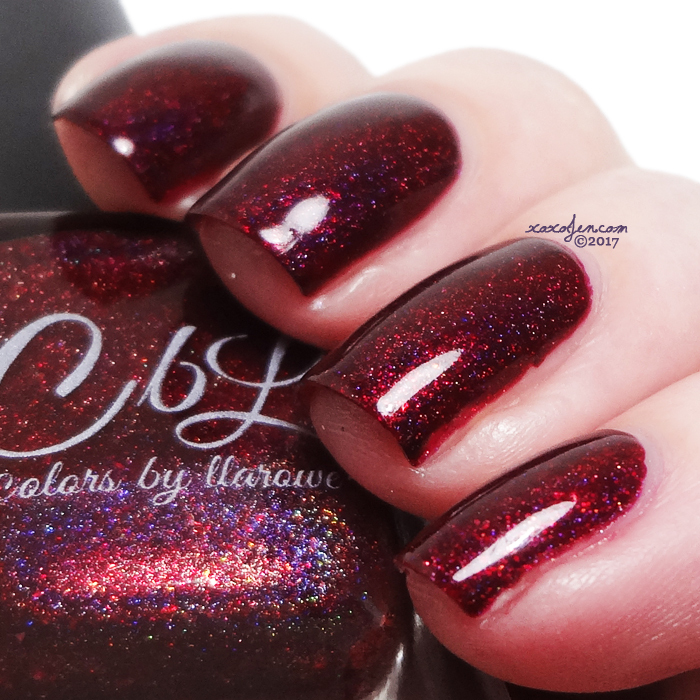 A burgundy base infused with illusion flakes and mixed together in a linear sauce. Perfect formula, shown in two coats. Because of her deep love for her father and their devotion to children's charities, Danette has chosen St. Jude's hospital for her kokua charity organization. Like a lavender unicorn, this sparkles and is magical. Shown is two easy coats. Mayo clinic that supports cancer research is Ever After's chosen charity. Rachel shared this: "Working with cancer patients gives you an eye witness account of how much of themselves they give to the fight and not only them, but their families, so many pieces of them. I feel like a piece of them always stays with me too especially getting to see them at different stages in their treatment. They remember me too. A little bit of kindness can make someone's day a little better." My favorite of the bunch! If you can only order one, this is the one. Shown is two coats, it wore like iron, and removal was a breeze even with all the sparkly things in it! Mariah has chosen a person, not an organization. to be the recipient of her kokua. Gretchen has been a part of our family since the idea was born in my head for this group. She encouraged me to start HHC. Over the past two years we have seen her struggle with a cancer diagnosis and the treatments that followed. She still has a long way to go on her road to recovery and Mariah has made a delicious polish to help her along. If that didn't warm the cockles of my cold, cold heart, she named it "Ohana" and I got a little misty eyed. Ohana means family, and that's exactly what Gretchen is. Ohana. Mariah says "We're all family around here and we need to not forget that." a perfect purple polish with violet, indigo, and purple microflakes, purple holo microglitters, Spectraflair, holo flakes, and scattered holo. Formula on the thick side but not unworkable. Shown is two coats, dries slightly textured due to curling flakes, foil method removal recommended. I hope you've enjoyed my review - be sure to join the HHC Fan group and order yours now through October 31st at 11:59pm HST! All of the colors are looking fantastic! Your swatches never cease to make me swooooooon!! !